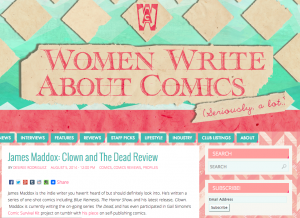 Both THE DEAD & Clown were given a spotlight today by the comic blog Women Write About Comics! With some fantastic things to say about both series, I’m especially humbled by the kind words reviewer Desiree Rodriguez had to say about my writing style and approaches. This entry was posted in Clown, Reviews, The Dead. Bookmark the permalink.